Rent The Maranello at Keating Hotel | Corporate Events | Wedding Locations, Event Spaces and Party Venues. Give your event personality when you host at the Keating. With 2,500 sq ft, our historic space can accommodate a wide variety of occasions with up to 150 guests; all facilities are equipped with the latest technology plus your personal events team on hand to ensure every detail is perfect. 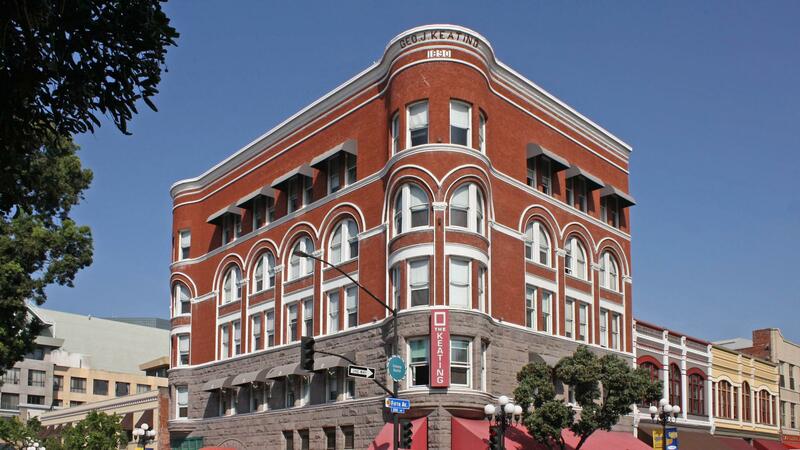 The Keating Hotel's meeting facilities are centrally located in the heart of the Gaslamp - just blocks away from the San Diego Convention Center, Civic Center, Balboa Theater, and Petco Park. Our historic, brick-lined meeting spaces are the perfect location for your next meeting, conference, private dinner, mixer, or any of your other event needs. Most of the perks are in-room at the Keating, which has few other on-site facilities to speak of other than a top-floor meeting and event space. The 2,500-square-foot meeting room highlights the historic architecture of the building, with a massive skylight over the central hall. A small business lounge room has a single computer (Wi-Fi is free throughout, included in the daily resort fee). There's also a simple fitness room with a Nordictrack machine and a weight bench. There's no restaurant or bar, though some rates include breakfast vouchers that can be used at Cafe 21 around the corner (attached to the hotel, but with a separate entrance).